If you’re a gardener yourself and have raised beds installed in your yard or a plot of ground you plant and tend every growing season, set aside a small section for your kids to plant whatever they want. (One of my favorite memories from childhood is growing pumpkins from seeds and watching with amazement as my plant eventually took over an entire corner of my dad’s garden.) Many neighborhoods also have community gardens; take your kids and make a family affair of planting, weeding and harvesting fresh produce. A garden can also be a couple of pots on a window sill in the house, or a pot or two on the backyard deck. Helping kids learn how to grow their own vegetables doesn’t have to be a time-sucking chore for parents. Including shopping (for seeds or young plants, containers, potting soil, fertilizer) and planting, with a few instructions for ongoing care, you and your child can create a mini garden in several hours over a weekend. The best plants to grow on a window sill are compact, miniature or dwarf varieties of plants and crops that mature fairly quickly. Leafy greens and herbs; miniature tomato, eggplant and pepper varieties; round varieties of carrots and radishes and dwarf varieties of peas and bush beans all work well. Tall and vining crops like corn, pole beans, squash, melon and pumpkins won’t work in the house; save those for an outdoor garden. A window sill garden grows best with an eastern or southern exposure for optimal sunlight, so what you are able to grow indoors will also be limited by the depth of the window sills in the best locations. 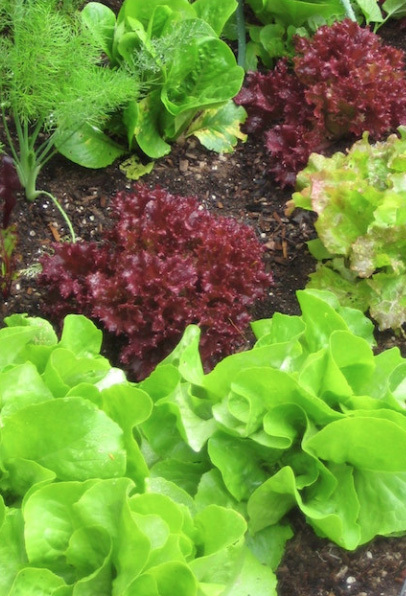 Many herbs can grow happily in six-inch pots, but a single head of lettuce needs a one-gallon pot and a small tomato plant needs a three-to-five-gallon container. Do a little research online or consult the expert at your local garden store to find out how much growing room your selections require. Let your child look through a seed catalog in which you’ve circled appropriate plants, and have him choose from your pre-selected items the ones he would like to grow. If you have the room, planting vegetables in pots on your deck allows for a larger variety of crops in your child’s produce garden. Like a window sill garden, a patio garden is easy to start and maintain. 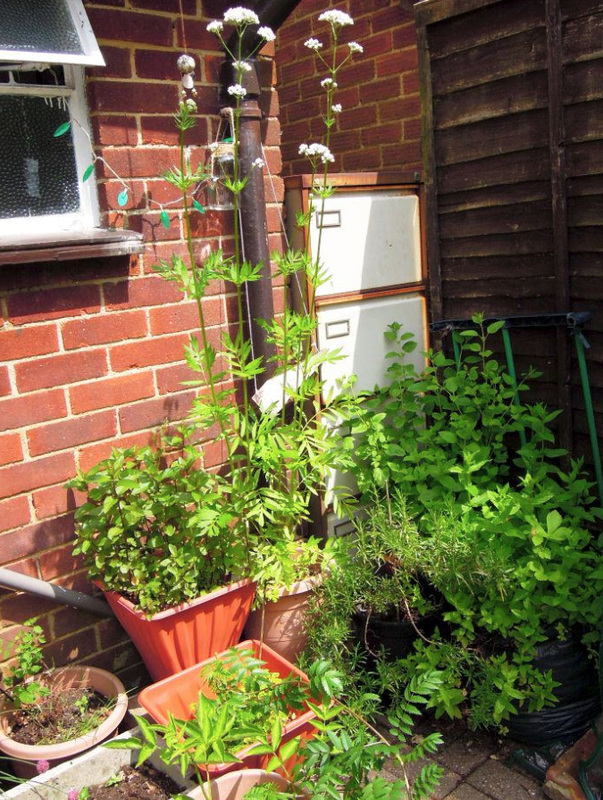 The containers rarely get weeds, they can be easily moved if you find they need more light or shelter, water is readily available and harvesting is quick and close to the kitchen. Steve Albert, on his wonderful website Harvest to Table, has a comprehensive list of vegetables on his website that is suitable for container gardening, along with information about minimum container sizes. Again, circle appropriate vegetables in a seed catalog and allow your child to choose from those. It’s very satisfying (and a good science lesson!) for a child to see a plant germinate from seed to full maturity, but there’s nothing wrong with buying veggies in four-inch pots from your local garden store and transplanting them to larger pots. The key is to let your kids get their hands in the dirt–and learn that doing so provides food for the table. They will be so proud of themselves the first time they make a salad, or perhaps a salsa fresca, from crops they planted and nurtured–and you can be proud of yourself for showing them where real food comes from. Salsa is one of the healthiest condiments available to add a bit of zest to a variety of foods, and it’s easy for a child to grow all the ingredients necessary to make it–either in pots on a deep window sill inside the house or in containers on the patio. 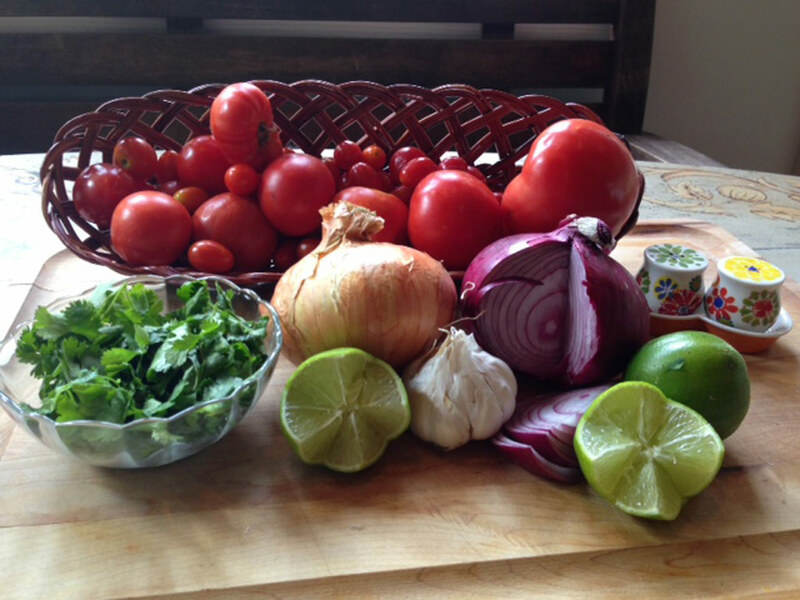 A typical salsa garden produces tomatoes, peppers, onions, garlic and cilantro. The best tomatoes for salsa are Romas or another meaty, firm-fleshed variety. For a salsa mild enough for children’s hyper-sensitive taste buds, I recommend poblano or Bermuda peppers and red onion, or a sweet white onion like Vidalia or Walla Walla. Not everyone likes the taste of cilantro (it’s a genetic thing); Italian parsley, basil, or a combination of parsley and mint can be substituted for cilantro in salsa recipes, although the flavor won’t be exactly the same. Mix all ingredients in a bowl, adding extra lime, salt and pepper to taste. Serve with your favorite tortilla chips. Leftovers (if there are any!) may be stored in an airtight container in the fridge for up to three days. Find more complete instructions for planting a salsa garden at Rodale’s Organic Life website. Salsa recipe adapted from Renee Adam at Bonnie Plants. Photos used with permission via creativecommons.org: Lettuce, Nancy McClure. Window sill garden, nh0k blu3. Patio garden, Elderberry Arts. Salsa ingredients, Bonnie Plants.